Prepare the chocolate cupcakes and icing. Make them homemade or from a package, it's completely up to you! Follow the directions on the package of candy melts and melt approximately 1 cup of orange candy melts. Stir in ½ teaspoon of cooking oil at a time until the candy melts have a smooth consistency. Dip each strawberry into the candy melts then place them on a parchment lined baking sheet to harden. Pour the remaining melted orange candy melts into a zip lock bag. Cut a small hole in the corner of the bag. Gently squeeze lines over the strawberries, going back and forth to make lines across the strawberries. Using a teaspoon measuring spoon, "dig" little holes from the top of each cupcake. Spread icing onto each of the cupcakes, then gently press them into a bowl of Oreo cookie crumbs. 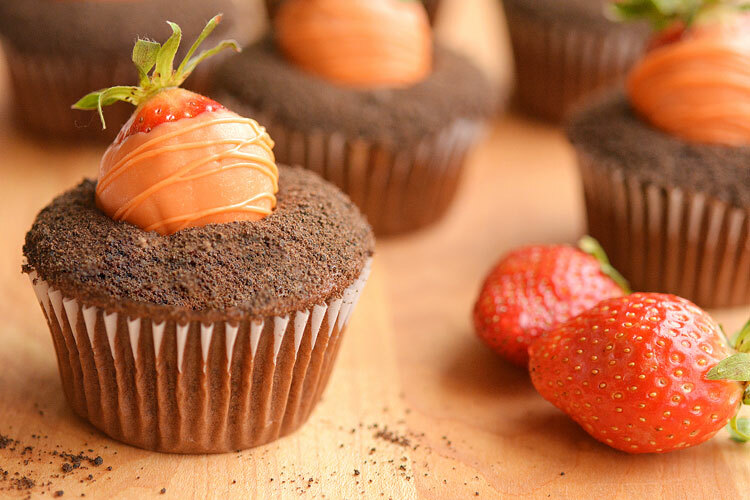 Place a strawberry carrot into the hole in the top of each cupcake.